This Roman 'Saxon Shore' fort was probably constructed between in the late 3rd century AD, and was one of a chain of eleven forts between Brancaster on The Wash and Portchester in Hampshire which were under the command of the 'Count of the Saxon Shore', a military commander whose forts and units are listed in the 'Notitia Dignitatum', a Roman document compiled around AD 395. These forts were built at different times, and the earliest forts (Brancaster, Caister-on-Sea and Reculver) may have been more to do with trade than defence. 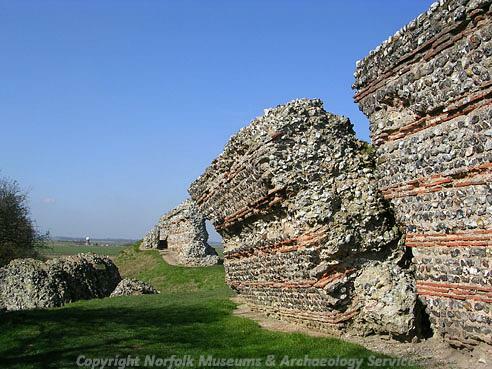 In the late 200s, further forts including Burgh Castle were built, and these probably had a more defensive role, protecting the coastline against barbarian raiders. Burgh Castle is also the traditional location of the Middle Saxon monastery founded by St Fursey in the early 7th century. 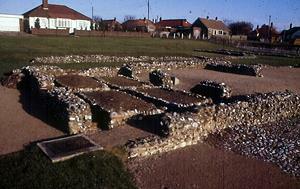 Parts of the fort have been excavated and large amounts of Roman and Saxon material and buildings has been recovered. A Norman motte and bailey castle was constructed within the fort. The motte was demolished in the mid 19th century, but is visible as a cropmark on aerial photographs and as a faint earthwork. Metal detecting in 2010 recovered a sherd of Ipswich ware. 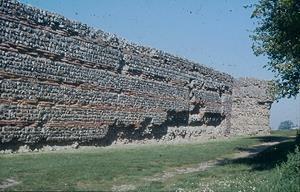 The Roman fort identified as Gariannonum was probably built between AD 260 and AD 280. The fort was subsequently used as a Saxon settlement. It is possible that this is the castle mentioned by Bede where St Fursey founded a monastery in AD 633. The Norman motte and bailey castle constructed across the south wall of the fort was removed in 1839 and the ditch surrounding the motte is still visible on aerial photographs. The internal arrangement of buildings can be visible on aerial photographs. North, south and east walls survive of the formerly complete quadrangular enclosure c. 205 x 100m internally. 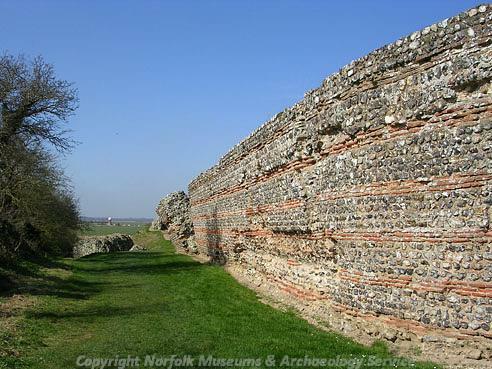 The walls stand to a height of 4.6m and consist of a neatly coursed facing of flints with brick levelling courses at regular intervals the walls are up to 3m thick at the base. The core is of rubble and mortar and there are six circular bastions which are in fact pear shaped in plan. Sockets let into the upper surfaces of the bastions pertain to a timber super-structure with a fighting platform. 1756. Possible Early Saxon cremations burials found, with two Early Saxon brooches. 1846. Sold. See copy of particulars in file. 1850. Further excavations produced Roman material. 1845 to 57. Various documented finds of Roman coins and metalwork, Middle Saxon coins. 1932. Roman colour-coated ware face jar (S13). 1954. Late Saxon disc brooch found. 1956. Roman coin Middle Saxon sherds found. 1957. Roman coin, Roman and Middle Saxon sherds found. Late Saxon brooches and Middle Saxon sherds. Ministry of Works excavation of site revealed the foundations of the Roman turret and another building, and a Middle Saxon structure with postholes and clay floors, probably dating to the 7th century monastery. Roman sherds and coins, Middle Saxon sherds and loomweight. (S14, S15 and S16) could be the illustrations for these pottery sherds. 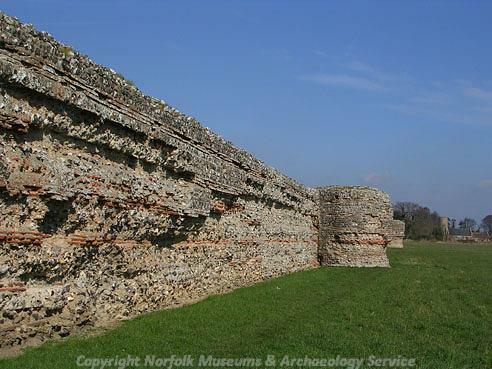 Ministry of Works excavations revealed Roman buildings adjoining the south wall of the fort, pottery coin hoards and other finds, (S18). Middle Saxon cemetery and church. Section through Norman motte showed it to be cut through south wall of fort. Hoard of late 4th/early 5th century glassware found in a copper alloy bowl in a pit, sealed by an Early Saxon floor. 1966. Roman sherds and jet disc or bead found. 1967. Roman and Middle Saxon coins found. 1968 to 69. Roman coins found. 1974. Beaker flint dagger found. Roman bone objects found, including part of a bone die with ring and dot markings, and a copper alloy pin, (S19). 1978. Roman sherds and bucket found. 1977. Roman sherds and Early Saxon sherds, and human bone on surface and in pipe trench. 1979-82. Finds of Roman, Middle Saxon, medieval and post medieval sherds, flints. 1981. Roman finger ring found. 1984. Roman sherds and brooch found. 1985. Roman sherds, bronze bowl found. Roman, medieval, post medieval metalwork, including Roman lead brooch pattern (S20). Roman, Middle Saxon, Late Saxon sherds. See full details, schedule, correspondence, excavation reports, notes on stone types and proposals for site in file. E. Rose (NLA) June 1999. 4 March 1996. NAU watching brief. On fence erection in area to southeast of Saxon Shore fort. Remains of brick wall (context 2) and clay ?floor (context 3) seen at depth of 0.7m in pair of newly excavated post-holes. T. Ashwin (NAU), 2 May 1996. 9 March 1996. NAU watching brief on clearance of dyke forming eastern boundary of reed beds immediately to west of Saxon Shore fort. No archaeology recorded, no artefacts found. Analysis of Roman helmet in progress. D. Gurney (NLA), 24 June 2003. (S5) suggests that the Roman name for the fort might have been Garannum and the River Yare Garannus, the latter meaning 'Heron river'. A number of cropmarks have been recorded from aerial photographs within the fort walls (S6-S10). These include possible traces of subsurface buildings and former structures of potential Roman date, the medieval motte and bailey castle and a number of undated linear features, some of which are likely to pre-date the fort. An overall NMP parent record has been created for all undated and unphased cropmarks outside of the fort walls (NHER 49203). The cropmarks that are likely to be Roman in date and associated with the vicus are recorded under NHER 49204. An additional undated phase of cropmark enclosures and trackways, which either pre-date or post-date the vicus are recorded under NHER 49205. 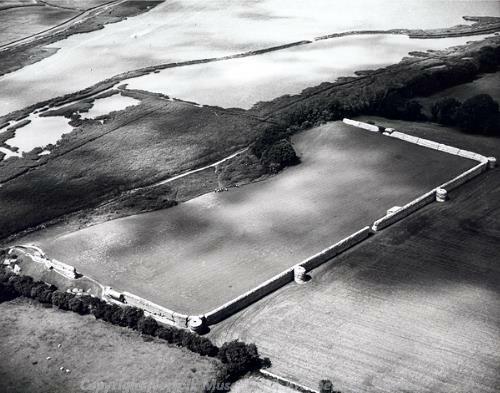 The majority of the cropmarks recorded within the fort are derived from CUCAP photography dating to 1949-1956 (S7-S8) and 1976 (S9-S10). The main possible structures identified are located within the northern section of the fort. A rectangular structure, measuring 16.5 by 9.5m, is visible within the northeastern corner of the fort. The parchmarks suggest a structure with quite thick walls or a spread layer of rubble (S9-S10). The interior of the structure appears slightly sunken and two dividing walls are visible, creating three cells, with an entrance to the south and a possible additional entrance to the west. Another parchmark and linears to the immediate west may indicate a conjoined structure. A second building or compacted surface is suggested by parchmarks to the south of the central northern tower. This consists of two parallel bands of parching, 6.5m in total width and 26m in length. A number of parched oblong and rectangular features are visible to the north and east. These features sit within a rectangular area defined by ditches. Unlike the structure to the east, it is not immediately clear whether these parchmarks represent subsurface walls or structures or whether they reveal surfaced and compacted areas such as internal fort roads. Two short walls may be suggested by two linear parchmarks running inwards from the main gate to the fort (S9-S10). This line is then continued by two parallel ditches (S7). It is likely that these also represent one of the fort roads. Other smaller parched areas, such as at TG 4745 0467 and TG 4748 0458, may indicate further structures or buried stone. At TG 4742 0456 in 1956 (S8) is an L-shaped area of lighter ground, measuring approximately 17m long and up to 15m across. This has the appearance of a stone deposit or structure being spread by the plough. In the southeastern corner of the fort is a possible rectangular ditched enclosure (S7). This measures 27m by 14m and is aligned the same as the fort suggesting that it is Roman or later in date. The immense ditches associated with the motte and bailey castle are visible within the southwestern corner of the fort (S7). This motte enclosure is up to 13m wide and 72m across and has two unusual inner ditch sections with bulbous and rounded ends. A curvilinear ditch conjoined to the main ditch to the east appears to be contemporary. Within the motte ditch are a further two lighter and possibly parched areas (S7). Although it is not clear whether this is caused by an archaeological subsurface feature or more recent agricultural activity. A number of fragmentary ditch cropmarks are visible within the motte. These are undated and may well pre-date the both the motte and fort. Two sub-circular features are visible at TG 4741 0455 and TG 4743 0457 (S7). The archaeological origin of these cropmarks is not certain and it is possible that they are the result of underlying natural features. S. Massey (NMP), 01 November 2006. Scheduled Monument Consent granted to construct access paths from the proposed new car park to the church and Roman fort. H. White (NLA) 7 January 2009.
c. 2003. Casual find on surface. A. Rogerson (NLA), 31 October 2009. February / March 2010. Casual find. A. Rogerson (NLA), 6 April 2010. --- Photograph: Q 15, CNC 15-17, CKF 15, BDT 9-10, EZR. --- Aerial Photograph: TG4704 A,AHT-AHY,AGA-AGD,AGF-AHE,AHM-AHR,AHZ-AJG. --- Article in serial: Harrod, H.. 1859. Notice of Excavations Made at Burgh Castle, Suffolk, in the Years 1850 and 1855. Norfolk Archaeology. Vol V pp 146-160. --- Article in serial: Wells, C. and Green, C. 1973. Sunrise Dating of Death and Burial. Norfolk Archaeology. Vol XXXV Pt IV pp 435-442. p 435. --- Aerial Photograph: Edwards, D.A. (NLA). 1994. TG4704/AJL - AJN. --- Aerial Photograph: Edwards, D.A. (NLA). 1996. TG 4704AJP - AJQ, AJS - AJX, AKB - AKC. --- Unpublished document: English Heritage. 1995. Schedule Report. --- Unpublished document: Cushion, B. (NLA). 1996. Burgh Castle. --- Unpublished document: Rumbelow, P. E.. 1933. The Saxon Shore Fort at Burgh Castle, Suffolk. --- Newspaper Article: Yarmouth Mercury. 1928. 19 May. --- Unpublished document: Crowson, A (NAU). 1997. NAU Report No. 245. Observations on erection of visitor information panel at Burgh Castle Roman fort..
--- Unpublished document: Hutcheson, A.. 1998. NAU Report No. 280. Report on an watching brief at Burgh Castle..
--- Article in serial: Mackie, C.. 1901. Norfolk Annals. Vol 1, 1801-1850. --- Newspaper Article: 1961. Eastern Daily Press. 1 May. --- Newspaper Article: The Times. 1961. 2 May. --- Newspaper Article: 1961. Eastern Daily Press. 2 February. --- Newspaper Article: Yarmouth Mercury. 1962. 18 May. --- Newspaper Article: Yarmouth Mercury. 1962. 16 May. --- Newspaper Article: The Times. 1962. 8 February. --- Newspaper Article: 1962. Eastern Daily Press. 8 February. --- Newspaper Article: Yarmouth Mercury. 1961. 22 December. --- Newspaper Article: 1962. Eastern Daily Press. 9 February. --- Newspaper Article: 1929. Eastern Daily Press. 2 July. --- Newspaper Article: 1931. Eastern Daily Press. 18 August. --- Newspaper Article: 1924. Eastern Daily Press. 2 July. --- Newspaper Article: 1996. Eastern Daily Press. 25 March. --- Newspaper Article: 1995. Eastern Daily Press. 27 June. --- Newspaper Article: 1995. Eastern Daily Press. 5 May. --- Newspaper Article: 1993. Eastern Daily Press. 22 June 1999. --- Newspaper Article: 1993. Eastern Daily Press. 20 June. --- Newspaper Article: 1990. Eastern Daily Press. 25 May. --- Newspaper Article: 1988. Eastern Daily Press. 16 November. --- Newspaper Article: 1988. Eastern Daily Press. 28 April. --- Newspaper Article: 1982. Eastern Daily Press. 4 November. --- Newspaper Article: 1982. Eastern Daily Press. 7 October. --- Newspaper Article: 1982. Eastern Daily Press. 1 October. --- Newspaper Article: 1982. Eastern Daily Press. 6 May. --- Newspaper Article: 1993. Eastern Daily Press. 25 June. --- Newspaper Article: 1989. Eastern Daily Press. 27 November. --- Newspaper Article: 1996. Eastern Daily Press. 16 March. --- Unpublished document: Anderson, S. M. and Birkett, D. A.. 1988. The Human Skeletal Remains from Burgh Castle, Norfolk, 1960. --- Article in serial: Morris, A. J.. 1947. The Saxon Shore Fort at Burgh Castle.. The Proceedings of the Suffolk Institue of Archaeology and Natural History. Vol 24, part 2. --- Unpublished document: Rumbelow, P. E.. 1928. Burgh Castle. --- Newspaper Article: 1938. Eastern Daily Press. 29 November. --- Publication: Unknown. 1922. Burgh Castle. --- Publication: Ives, J. 1803. Remarks upon the Garianorum of the Romans. Second Edition. --- Article in serial: Gregory, T. 1979. A Romano-British Bronze Bound Bucket from Burgh Castle. Norfolk Archaeology. Vol XXXVII Pt II pp 223-226. --- Unpublished document: White, S.. 1997. Outline proposals for the interpretation of Burgh Castle Roman Fort and its landscape. --- Newspaper Article: Eastern Daily Press. 2011. Historic Roman fort wall pushed down by vandals.. 26 August. --- Photograph: 2003. HKZ, Possible Romano British helmet. --- Newspaper Article: Eastern Daily Press. 2011. Roman fort to appear in new TV series. 28 October. --- Archive: Clarke, R. R. and NCM Staff. 1933-1973. Norwich Castle Museum Record Card - Neolithic. Burgh Castle. --- Archive: Clarke, R. R. and NCM Staff. 1933-1973. Norwich Castle Museum Record Card - Roman. Burgh Castle . --- Archive: Clarke, R. R. and NCM Staff. 1933-1973. Norwich Castle Museum Record Card - Early Saxon. Burgh Castle . --- Archive: Clarke, R. R. and NCM Staff. 1933-1973. Norwich Castle Museum Record Card - Late Saxon. Burgh Castle. --- Archive: Clarke, R. R. and NCM Staff. 1933-1973. Norwich Castle Museum Record Card - Medieval. Burgh Castle . --- Archive: Clarke, R. R. and NCM Staff. 1933-1973. Norwich Castle Museum Record Card - Middle Saxon. Burgh Castle. <S1> Unpublished document: Heywood, S.. Historic building report for Burgh Castle, Burgh, Norfolk..
<S2> Monograph: Johnson, S. 1983. Burgh Castle: Excavations by Charles Green, 1958-61. East Anglian Archaeology. No 20. <S3> Publication: Johnson, J. S.. 1978. Burgh Castle, Norfolk. <S4> Unpublished document: Ashwin, T.. 1996. NAU Report. 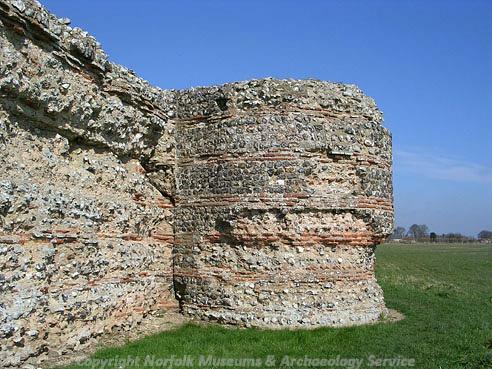 Watching brief for Norfolk Archaeological Trust at Burgh Castle..
<S5> Article in serial: Breeze, A.. 2006. Ptolemy's Gariennus, Burgh Castle and The Yare.. Proceedings of the Suffolk Institute of Archaeology and History. XLI, Part 2, 227-9. <S6> Oblique Aerial Photograph: Low, F.. 1933. NHER TG 4704ABH (LOW 087) 23-JUL-1933. <S7> Oblique Aerial Photograph: CUCAP. 1949. NHER TG 4704A-B (CUCAP CQ044, CQ052) 24-JUN-1949. <S8> Oblique Aerial Photograph: CUCAP. 1956. NHER TG4704AHF (CUCAP SP87) 28-MAY-1956. <S9> Oblique Aerial Photograph: CUCAP. 1976. CUCAP (BYB91) 24-JUN-1976. <S10> Oblique Aerial Photograph: CUCAP. 1976. CUCAP (BYZ16) 03-JUL-1976. <S11> Scheduling record: DCMS. 2008. Scheduled Monument Consent. <S12> Illustration: Unknown. Unknown. Sketches of a two Roman urns, an arrowhead and a fibula found between 1756-1852.. Paper. Unknown. <S13> Illustration: Unknown. 1932. Drawing of a Roman jug.. Paper. Unknown. <S14> Illustration: Green C.. Unknown. Drawing of Roman pottery sherds.. Paper. Unknown. <S15> Illustration: Green C.. Unknown. Drawing of Roman pottery sherds.. Paper. Unknown. <S16> Illustration: Green C.. Unknown. Drawing of Roman pottery sherds.. Paper. Unknown. <S17> Illustration: Unknown. Unknown. Sketch of a Roman decorated vase.. Paper. Unknown. <S18> Illustration: Unknown. 1980. Drawing of a Roman helmet.. Paper. 1:4. <S19> Illustration: Gregory, T.. 1976. Drawing of a Roman copper alloy pin, a bone object and a shard of Samian ware.. Card. 2:1. <S20> Illustration: White, S.. 1998. Drawing of a Roman lead knob/handle possibly a model from making a brooch mould.. Film. 2:1.